When traveling abroad it’s always difficult to understand the tipping culture in that country. Tipping in Thailand is no different. When should you tip in Thailand, are you tipping in Thailand enough? Our first trip was on our Thailand honeymoon and since then we have lived in Thailand for the past 3 years, so we’ve put together a guide to tipping in Thailand to help you out. This tipping in Thailand guide is intended for tourists in Thailand, as it is not common for local Thais to tip. Even though tipping in Thailand is becoming more and more common. Tipping in Thailand is not mandatory but always appreciated. Europeans will read this and tell us we are crazy for tipping this much and Americans will feel guilty for tipping this little, however, this is what is generally accepted for tipping in Thailand. As a tourist in Thailand, please realize how little daily wages most locals are paid. The average Thai wage is less than 9,000 baht a month ($300USD). That extra twenty baht tip may be nothing to you but can really add up to the local server. Tipping roughly 10% of the bill is a good tip, and rounding up or down just like you would do at home. If eating at a fancier restaurant and the bill is higher, you can ignore the 10% rule and give based on how the experience was with a minimum of 100 baht tip. Always check the bill and see if a service charge was added, if a service charge was added no need to tip. When tipping in a sit-down restaurant it isn’t a straight percentage of the check. Also, look at the cost of the meal and the service. Just like you would at home. If you had a not so good waiter at home would you tip? Yes, you probably would tip but you’d just tip less. If you had an amazing server you’d tip a little extra. And if you had a terrible server and dining experience you probably wouldn’t tip. The same goes when tipping in Thailand at restaurants. It is not common to tip street food vendors if you do tip they likely are confused and try to return what they see as an overpayment. Most street food items are fixed and have clearly labeled prices and no tips required and it is not acceptable to barter on the price of food. If you happen to see a tip jar at a street food stall and it was really tasty throw in a few baht coins. How much to tip in Thailand at a bar really varies from bar to bar. If it is a bar where you go up to the bar and order your own drinks no tip is required. If you are at a beach bar all day in Koh Lipe you may want to tip 10 baht on the first drink so that the waiter comes and checks on you later. If they don’t come back to check on you then don’t tip on the next drink. If you have been sitting at the bar for a few hours chatting with the bartender and having a good time tip 50 baht or so. Always check the bill and see if a service charge was added, if a service charge was added no need to tip. It is common for the sky bars in Bangkok to charge a service charge, so no need to tip unless it was exceptional service and you want to leave an additional tip. No need to tip at fast food restaurants or coffee shops like KFC, McDonald’s, Starbucks, Tom Tom’s, etc. If a server doesn’t come to your table no need to leave a tip. Before entering a taxi in Thailand make sure to agree on a price in advance or make sure it will be a metered fare. It is common to round up the fare to the nearest bill and leave the change as a tip while taking a taxi in Thailand. UPDATE: Uber is rarely in Thailand if at all but Thailand has something similar called Grab Taxi. Just download the Grab Taxi app, it works just like Uber. You mark your pickup and drop off addresses and it tells you an estimate of the fare and you can pay via the app with your credit card. We now typically use Grab if we are going somewhere complicated or aren’t near any taxis. Uber/Grab Taxi is in Thailand and our preferred mode of transport in Thailand. Uber/Grab taxi in Bangkok is super easy and cheap. We have used Uber & Grab Taxi in Bangkok and Chiang Mai dozens of times. It’s great as you don’t have to agree on a price or try and communicate where you are going. We asked several expats living in Bangkok if they tip Uber drivers and they said yes on average at least 10 baht. For example, an 11 km ride that takes 23 minutes costs only 90 baht. Uber takes a large amount of your fare, and any tips the drivers will appreciate. Always negotiate the price before hiring a tuk-tuk. In Bangkok and other tourist cities, some level of bartering is expected over the fare. Tuk-tuk drivers in Bangkok especially are known for their scams of overcharging or bringing you to shops that they will get a commission from. We try and avoid using tuk-tuks if possible. For tuk-tuk drivers in Thailand only pay the price agreed upon for the ride tipping is not expected. After a relaxing massage wouldn’t you feel guilty not tipping? Being a masseuse is a hard job and it doesn’t pay well. Many masseuses get only a small fraction of what you pay for a massage. I try and tip at least 15%. Try to give it directly to the masseuse to ensure it goes to the correct person. One of our favorite things to do in Thailand on a rainy day is getting a massage or three. If you are staying in a nicer Bangkok hotel, they will most likely send your luggage up to your room. What you should tip depends on how much baht you have. I personally don’t like tipping coins, so typically my tips will be 20 baht/50 baht/ 100 baht. Again there is no tipping in Thailand rule, but you will notice the bell boys hang around the door when exiting. They will graciously accept a tip. This one can be tricky. Tipping maids in Thailand is common in higher end hotels. You will notice this when you see a tip envelope in your room. Place your tip in the envelope for the maid. If you are staying at a 3-star hotel or less, tips are not common. If there is no envelope the maid might not know money left in the room is a tip and not take it. This may sound strange, but if you left a 50 baht bill on the bed they might move it to the desk assuming you left it behind. This has happened to us. The best for tipping the housekeeping in Thailand is to literally hand it to them or make it super obvious that it’s a tip. A thank you note with the money on top, etc. Getting a tattoo in Thailand is a souvenir that will be with you forever. Even better would be getting a Sak Yant tattoo, a traditional Thai tattoo. If the tattoo artist draws you up a custom design that you totally love show him your appreciation with a tip usually 10% or at your discretion. As a general rule 10% is a good tip for a hairstylist. Higher end hair salons in Thailand will most likely have a tip jar at the checkout, even though I always prefer to hand my tip directly to the person helping me. If visiting a local Thai hair salon there is no need to tip but a 20 baht tip would be nice. I personally go to an Aveda salon in Chiang Mai that is very pricey and I am sure every customer tips something. Every tour is different and the tip will vary tour by tour. We’ve had amazing tours in Bangkok where our guides went out of their way to make sure we had a great time. Several of our tour guides showed us things we would have never found on our own and gave local tips. We’ve also had some tours that were really boring. No matter what suggest tipping the tour guides something and a little more to the awesome guides. Not every place will have bathroom attendants but if you’re out at night you’ll see them at some restaurants/bars. Also, note that is common to pay to use the restrooms usually 10 baht and pay a few baht for some toilet paper. I usually carry a small think of kleenex in my purse, you can purchase this from the ladies or right at 7 elven. If you notice a tip basket and you see that an attendant is in the bathroom the whole time then I’d tip them. Would you want to be stationed in the bathroom all night? If you visit the bathroom several times in the evening no need to tip every time. Knowing what to tip in Thailand or who to tip is frustrating. Hopefully, our tipping in Thailand guide has helped you figure out how much to tip in Thailand for all sorts of situations. We would love to hear how much you tip where you are from. Leave a comment below! Airbnb first-timers, if you sign up through my referral link you get a $40 credit when you book your first trip! –>> sign up here! If you already have an account register a second account for your travel partner to get $40 off your next trip. New guesthouses are being added constantly. If you need any help finding accommodation in Koh Lipe, always check Agoda as I have found them to have the best selection in Thailand. If you are planning on doing some Thailand island hopping book your transport online here. Ferry schedules and bus schedules are all online and bookable. For the cheapest airfare within Thailand and most of Southeast Asia, look for Air Asia. Hi. Great article. We are off to Thailand soon. We are staying 3 nights in one and 8 in another hotel. Do you tip daily for housekeeping or pay at the end of your stay? We would tip daily as it isn’t always the same housekeeper every day. We also don’t get our room cleaned daily, we do every 2-3 days with fresh towels daily. Hope you have a great time in Thailand! That’s great to hear. Where the staff very thankful? If you could also advise on whether taxi fares are calculated based on distance or duration? If you could offer a rough guide of how much a reasonable price to agree on with taxi drivers depending on how far you’re travelling (km/miles) that would be awesome. Thanks in advance! Grab is the most popular service in Thailand available in most major towns including Phuket. Taxi fares are calculated on time and duration if they use the meter. If you can, try to only use metered taxis – unmetered you always pay more. Thank you for the information, very useful..
How much should I tip for airport wheelchair service? The guys are very knowledgeable and helpful. Great question. I would tip the same as you would in your home country. How long were they with you? Where they nice and chatty? Did they help you with all the bags and be patient? You could tip them in baht or USD if you just landed. Quite helpful but what’s a reasonable tip if you stay several days in a Hotel and there is a “Tips” box at the checkout desk? Great question. You will notice everyone has a tip box, and if you ask me it’s because they’ve seen it other places and they thought “What the heck why not put one out and try.” If the person behind the tip box was super helpful or did something nice throw a 20 in (only 60 cents USD). Odds are next time you come to the desk they will remember that and if you have any other questions/favors they will go that extra mile for you. But typically these boxes have no real tipping reason. We don’t tip in our country. People get paid by their employer. You should do the same in your country. But more importantly it ensures the customer and the service provider are equal participants, doing their job without direct financial incentive. Good service with a free genuine smile. I hope you understand the negative consequences of habitual tipping, and the undesirable consequences of tipping culture. What country do you live in? In our home country the USA, waitresses get paid around $3 an hour and depend on tips. As a traveler you should research the local tipping culture and adapt to it. You should tip in Thailand in the end it’s only a few dollars and they will be thankful for it. Now if they add on a service charge that is the tip then we wont tip because they have built that into the bill. Having been in the food and beverage industry, I spent my first 10 years of serving/bartending getting paid $2.85/hour. A lot of states have minimum wage but also a separate, and very legal, service industry minimum wage, which is usually less than half of the state’s minimum wage. Taxes are never simple. If you have a solution for simplifying the United States of America’s state and federal tax problems, then please, by all means, contact our government and teach us the answer to all of our problems. What a blessing it must be to live in a such a perfect and financially balanced country. Having been in this industry for almost 18 years, personally, I treat ALL of my customers equally, but that is not reciprocated by the customer, nor should it. The customer and the service provider are NOT equal participants, that is not even the goal. “SERVICE PROVIDER,” means someone is providing a service to someone else, by nature a small hierarchy lays there. What an asinine thing to say, “doing their job without direct financial incentive,” in that case why get paid at all? Do you do your job without direct financial incentive? How honorable and philanthropic of you! Well, here in the real world, most of us get a paycheck. No, actually, due to first impressions I would lean to say that you are probably someone who demands and expects quite a high dollar and undeserved respect for your time. No server ever knows how much they are going to be left in gratuity, or if they are going to insulted by someone like you and left nothing. The gratuity concept does not reflect the equality of people, it reflects the amount of appreciation the customer has for exceptional service. Indeed it does not compliment well on your character to be making such pompous and condescending comments towards someone who has written such a well informed article on how to give tribute and consideration to another culture. You not only insult the author, you insult our home country, you insult the service industry, and fortunately, you insult yourself by making such a pretentious and short-sighted statement. I hope you enjoy a lifetime of mediocre experiences that will most certainly find you and your frugality. Well put Jenn! As a 20+ year veteran of the biz, my wife and I typically tip upwards towards 30-40%. We do this because of people like Penguin. It must be nice to be so above the rest of us. We just landed in Thailand and found this to be very helpful. Interesting that someone who doesn’t tip is reading a “how to tip” guide. May he forever eat the hair of the service industry!! I bet he/she doesn’t mention that they don’t tip at the beginning of their service…hmmm. Interesting. We are so jealous! 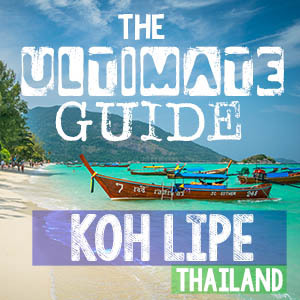 Where did you all eat in Koh Lipe? Are you talking about masseuses in general or in Thailand? In Thailand specifically I would say 50%+ of the customers don’t tip at all and I think that’s not right. If it’s an amazing massage I have no problem tipping way more or the prices of the massage. I think they should be tipped no matter what and more if they listened to what you asked for or did a good job. Tipping in Thailand is just like anywhere else in the world, if they did an amazing job you tip more. My boyfriend and I are about to head off for a 2 month trip to Thailand so this is extremely helpful, thanks for sharing! I often find myself frustrated when tourists from the states don’t tip at all, especially in countries where tourism is a main form of income. 2 months in Thailand is amazing! You’re going to really get to explore the country. Where are you all headed? Sitting here having a great 2 hour foot massage. I’m from US and will tip the person 200 baht. The massage is 450. I’m near the door where people pay and watching almost every European pay the bill and turn and walk out leaving their therapist standing there. They even ask for extra water to take with them. Almost all Asian and American customers – even teenagers, stop and leave a tip!! “If the tattoo artist draws you up a custom design that you totally love show him your appreciation with a tip usually 10% or at your discretion.” I personally agree with this line. For having a tattoo in Thailand is a souvenir that will be in us forever. You should always tip a tattoo artist it shouldn’t matter if you’re at home in the USA or in Thailand. Hopefully, more of your customers will read this and tip you accordingly! Great article and very helpful. We are fortunate to be staying in a lovely resort where we have access to a “personal explorer” (kind of a butler shared with other guests). Can you help in how much we should tip in this instance? We’re very keen to not offend by under or over tipping. This will really depend on how much time and effort your personal explorer spends with you. Keep in mind the average salary for a Thai service worker is about $300-400 USD per month. Without knowing all of the details, a tip of $5-20 per day depending on the level of personal service would be what I would expect. I would really encourage to tip when you are receiving a good Thai Massage. A lot of massage therapist are working on a fee per client basis. So if you pay 250 baht for a massage, they maybe receive 100 baht. If it is a good massage I normally tip 50 or 60 baht, when I do not like the massage I tip 20 baht. If you want to help, buy and eat local, don’t bargain. In Thailand, in particular, we have lived and have Thai friends and know that Thai’s do tip in certain situations (spa/nice restaurants/etc). We would never tip at a street food stall or anything because yes then if all tourists did it would drive up the price and make the vendors treat us better than the locals. Those that work in the tourism industry know that they potentially could get tips and it’s part of the job. We do buy local and we don’t bargain for food, not sure where you got that impression. Thank you so much…. this is really helpful n so fun to read. I’m from Singapore n we dun usually practice tipping in Singapore. So It’s always a guessing game of how much to tip when go travelling. Again thank you so much for putting up the article. We readers are Super appreciate this. I wish I could tip u for your effort. My friend has a Japanese wife who tipped 40 baht for her massage and was asked, “You’re Japanese?! ?” They go to Thailand (Bangkok and Pattaya) frequently (at least twice a year). I’ve never been but I dream of going for a month and getting massages every day. =) Good to have another source to check on tips! The locals will be happy with any tips in Thailand. Glad you found our tipping guide helpful for your upcoming Thailand trip. Let us know if you have any other questions. Safe travels. Fabulous tipping guide! So helpful! Thanks, glad we could help! Let us know if you have anymore Thailand questions. Safe travels! Thank you so much for this detailed tipping guide! I am always super tense when it comes to that moment because I don’t want to get it completely wrong. worrying about it instead of enjoying my thai massage etc …you did more or less confirm my ideas do I am comforted!